15 Ways To Prevent A Car Break-In | Calgary Alarm Inc.
Close all windows and the sunroof; lock the doors of your car and turn on your car alarm when your car is unattended, even for less than a minute. Keep your car keys out of sight, even at home, since many cars tend to get stolen after a house break in. Park your car in a well-lit area, possibly within view of CCTV cameras, especially when leaving your car for a long time, like overnight. Avoid leaving valuables like cash, a laptop, a mobile phone, credit cards, your jacket, or even a nice hand bag in the car where these items will be visible. If you must leave your possessions behind, keep them in the trunk of your car. Never leave items or material in your car that say your home address. Keep your vehicle documents well hidden at home. Consider installing an electronic engine immobiliser to stop your vehicle from starting. Get it professionally installed and have the switch placed in a discrete and concealed spot. Get an alarm system to deter thieves from breaking into your car or stealing it. Consider etching your Vehicle Identification Number (VIN) onto your windscreen, side mirrors, windows, headlights, and tail lights to deter thieves from stealing them. Property mark the equipment in the car, such as satellite navigation systems and stereos, with your postal code. 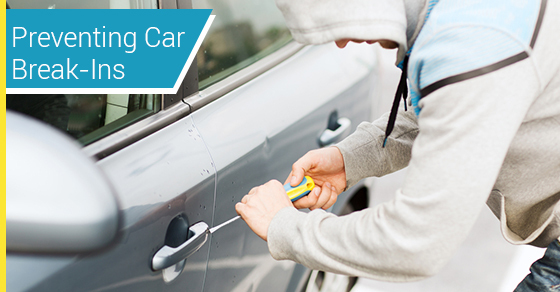 Use a steering lock, also referred to as a j-bar, collar, or club to deter thieves from even breaking into your car. The device locks to the steering wheel, brake, or column, preventing the wheel from being steered more than a few degrees. Approach your vehicle with the key in hand. Look around and inside before opening the door. When driving, keep the car doors locked and the windows rolled up. Be alert at gas stations, shopping malls, ATMs, intersections, and retail stores – as carjackers frequent these spots. Finally, trust your instincts. If you spot suspicious activity or feel uneasy about leaving your car somewhere, find another parking spot.